Ask a teacher what their biggest frustration is and you’ll hear a lot of answers, but there’s one frustration that is all too common: students who don’t do their work. Now we all know students are going to miss an assignment here and there. Things happen. But when a student consistently doesn’t do their work, it produces big problems. And when you have class where the majority of students don’t do most of their work – yikes! I’ve had a few classes like that and can totally commiserate about how frustrating it is to try to go over an assignment that only 5 of the 25 kids actually did. A classroom culture that says “work doesn’t really need to get done” is not only frustration for us teachers – it’s devastating for the students. They can’t learn if they’re not engaged and active. And for those who are struggling, they’re only going to get farther and farther behind without practice. But we’re not here to commiserate. We’re here to find some ideas – to try something new. And, yes, I know you might’ve already tried some of these ideas. But I’m encouraging you – don’t give up. Choose a few that resonate with you and try again. Our students need us to figure out what will work for them. Oh and by the way, these ideas are not all mine – many of them came from a fascinating conversation in our Christian Teachers’ Lounge Facebook group. Thanks to all those who gave such great suggestions. Require the student to complete the assignment in your room during lunch. I know it’s tough to give up lunch, but let’s think about this: If you required students who didn’t finish their assignment to finish it in your room during lunch, do you think you’d have many missing assignments? You can also co-op with another teacher or two and take turns watching each others’ students. – Catelyn M.
Use class dojo. Class Dojo is a fantastic behavior tracking system. Assign positive points for completed work and negative points for missing work. You can even set it up to notify parents of missing work. – Carlon P.
Grade & return assignments quickly. If you’re just walking around & glancing at the work to see if it’s done, students get the impression that it doesn’t really matter – so why should they do it? 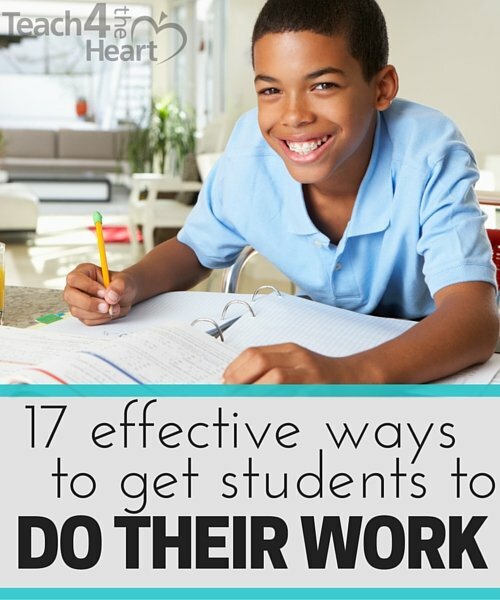 Instead, collect homework/classwork and assign a quick grade. (I explain how to do this quickly & fairly in this article here.) Turn it back to them within a day or two so that they get quick feedback and can see how doing (or not doing) assignments is affecting their grade. – Angie A. Over communicate. Post assignments clearly – in more than one place if possible (in the classroom and on your class website). Email parents to keep them in the loop. – Laurie O. Talk about a growth mindset & goal setting. We can cajole, threaten, and nag. But ultimately it’s the students’ responsibility to do their work. So invest time in discussing growth mindset & helping them create their own goals for your class. Absolutely require major projects to be completed. Make the completion of major projects (such as papers, science projects, etc.) a requirement for passing the course. They don’t complete the project, they don’t pass the course & must attend summer school or retake it. A hard line like this puts the ball back in the student’s court & makes the choice pretty obvious. – Laurie O. Deduct points for late assignments. Deduct points every day an assignment is late. Offer a help session. Consider offering a help session before school, during lunch, after school, or during a study hall. This makes help available for students who needs it while also putting the responsibility on them to take advantage of this resource. If parents complain last minute about poor grades, it’s a clear answer: “Your student declined the extra help I offered.” – Lena K.
Post a missing work list. Require missing work to be finished & post a list of all missing assignments somewhere in your classroom. An alternate idea is to keep a computer document of all missing assignments & print copies to post/hand out. Encourage a strong work ethic. It’s doubtful this will change anything overnight, but use every chance you get to encourage a strong work ethic and to remind kids that the habits they’re creating now will translate into real life. This isn’t a time to lecture, but it is a time to inspire them and help them understand that their life will be a result of their choices and their hard work (or lack thereof). Use Remind101. Remind 101 allows you to text students through the system without exchanging any phone numbers. Texting your students early evening to remind them of assignments takes away the “I forgot” excuse. Reynolds B. said that her grades went from D’s to B’s when she implemented this system. Create the right atmosphere. As the teacher, you set the tone for your classroom. Don’t coddle your students, but teach them that if they do their work, they will succeed. If they don’t, they won’t. – Reynolds B. Develop a school-wide plan. If assignment completion is a problem throughout your school, discuss this with your administration and see if you can come up with some school-wide solutions. If the culture of the school is “we don’t really have to do our work,” then having all the teachers on the same page & making big changes together might be the fastest & most effective way to change that culture. Thanks to everyone who shared an idea! What else would you add to the list? Should we not have our lunch period to ourselves, or must we give every moment of our day to our students? Several of your suggestions put the work on the teacher, not the student. You totally have to figure out what works for you. For some teachers, it’s worth it to give up lunch occasionally to not have to deal with tracking down all the missing homework. To others, it’s more work than help. Depends on you & your situation. I will not be giving up my lunch period!! That is MY time. I’ve found (for middle school) that making a schedule to help get the ones with missing assignments that are adding up really helps. Sometimes what the issue is, is that the kids have so much to do that it seems impossible. So, by chunking missing work, it makes the 10 things missing a lot more manageable for the student. Yeah, it’s a lot of work for the teacher if you have a ton of them, but I find that it really does help. And if you save them, you can email them to parents and show administrators if there’s any question about what you are doing. As a teacher it’s your job to see that students succeed. If they don’t then you are not doing your job. Not all students learn the same, find out what their strengths are develop them. Cookie cutter does not work for all students. HAHA!! Its a teachers job to provide an educational environment and assist students with their learning. If students do not take an active approach to learning, nobody will be able to make them finish assignments. What ever happened to parents being involved in their own Childs education. With online grade books and parents being able to track their kids grades, you would think that there would be more students getting their assignments done. Teachers only have a limited time with a student each day or every other day, they can not control what happens the other 23 hours of the child’s day. I agree one of my classes turn in most of their work and hw- the other many are failing due to I don’t care the district will pass me on anyway (which is true).